Senior center has played in 51 straight games for USU. 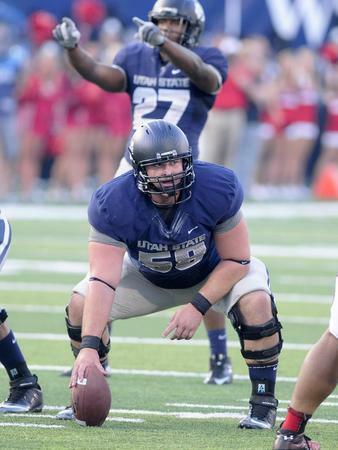 LOGAN, Utah - Utah State's Tyler Larsen has been named one of six finalists for the 2013 Rimington Trophy, which is presented annually to the most outstanding center in college football, it was announced Monday. Joining Larsen as finalists for the Rimington Trophy are Reese Dismukes (Auburn), Hroniss Grasu (Oregon), Gabe Ikard (Oklahoma), Bryan Stork (Florida State) and Travis Swanson (Arkansas). The winner of the Rimington Trophy will be presented live during the ESPNU Red Carpet Show on Thursday, December 12, 2013, immediately preceding the ESPN Home Depot College Football Awards Show. Both shows will originate from the Atlantic Dance Hall on Disney's Boardwalk at the Walt Disney World Resort in Lake Buena Vista, Fla. The winner of the Rimington Trophy is selected by determining the consensus All-American center pick from three existing All-America teams: the Walter Camp Foundation (WCF), the Sporting News (SN), and the Football Writers Association of America (FWAA). The winner will be recognized at the Rimington Trophy Presentation at the Rococo Theatre in Lincoln, Nebraska on Saturday, January 11, 2014. Larsen, a 6-4, 312-pound senior offensive center from Salt Lake City, Utah (Jordan HS), has earned first-team all-conference honors as both a sophomore and junior. As a senior, he has graded out above 86 percent in every game and above 90 percent six times, while recording 49 knockdowns. Overall, Larsen has played in 51 straight games at Utah State. This season, Larsen has anchored an offensive line that has helped Utah State rank fourth in the Mountain West and tied for 37th in the nation with an average of 32.6 points per game despite losing five players to season-ending injuries, including staring quarterback and Heisman Trophy candidate Chuckie Keeton. USU's offense also ranks fourth in the MW and 37th in the nation in passing efficiency (138.1), fifth in the MW and 33rd in the nation in completion percentage (.619), sixth in the MW and 41st in the nation in rushing offense (178.8 ypg), sixth in the MW and 49th in the nation in total offense (420.9 ypg), and 10th in the MW and 55th in the nation in passing offense (242.1 ypg).